Objective: This study was aimed at evaluating the usefulness of paired box-2 gene (PAX-2) in the diagnosis of renal tumors. Materials and Methods: This study included 60 renal tumors. The newly prepared hematoxylin and eosin stained slides of all cases were evaluated and the diagnoses were confirmed or revised for each tumor according to the 2004 World Health Organization classification of renal tumors. 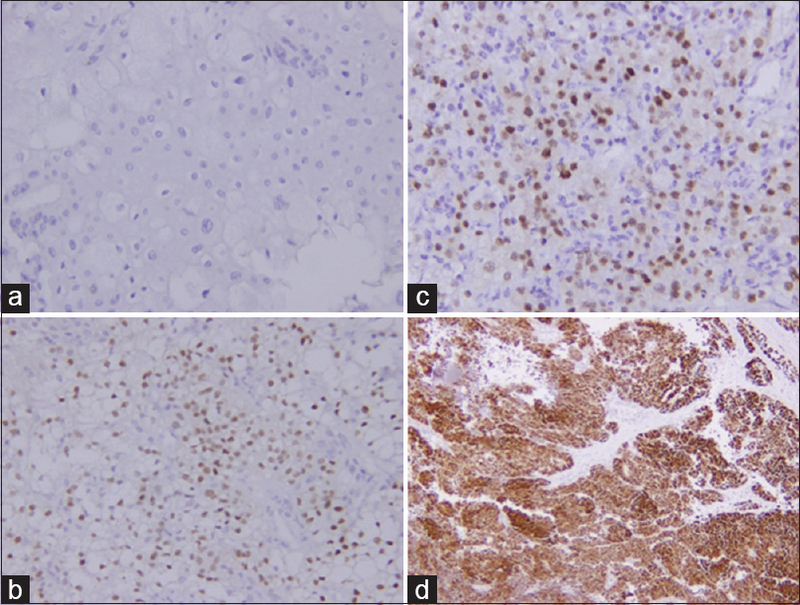 Representative and consecutive sections of each tumor were submitted for anti-PAX-2 antibody immunohistochemistry. The pattern of staining (nuclear or cytoplasmic) was also noted. PAX-2 expression in tumors was correlated with low- and high-nuclear grades (Fuhrman nuclear grades). Results: The 45/60 (75%) cases showed PAX-2 nuclear immunoexpression. The frequency of positivity in renal tumors was seen in 29/34 (85.5%) and 12/15 (80%) cases of clear cell RC, papillary RCC, respectively. The PAX-2 was positive in 20/45 cases for score 1+. The 16/45 cases were categorized into score 2+, and 9/45 cases were categorized into score 3+. Conclusion: PAX-2 is a diagnostically useful marker for primary renal tumors and is inversely proportion to the grades of the renal tumor. Objective: This article shows our experience on sentinel lymph node (SLN) biopsy in early-stage cervical carcinoma since the technique was introduced in our Institution. The main objective is to analyze the detection rate (DR) of metastatic SLNs, identifying prognostic factors for an increased risk of nodal metastases. Our second aim was to compare the accuracy of nodal metastases DR between intraoperative analysis and postoperative ultrastaging. Materials and Methods: Forty-one women with the International Federation of Gynecology and Obstetrics stages IA2-IIA1 who underwent laparoscopic surgical treatment applying the SLN technique, from December 2011 to June 2016, at La Paz University Hospital, were included. The sentinel node was identified using technetium and methylene blue dye or indocyanine green near-infrared fluorescent imaging, analyzed intraoperatively, and compared to deferred ultrastaging. Results: SLN DR was 100%, with a bilaterality rate of 83%. 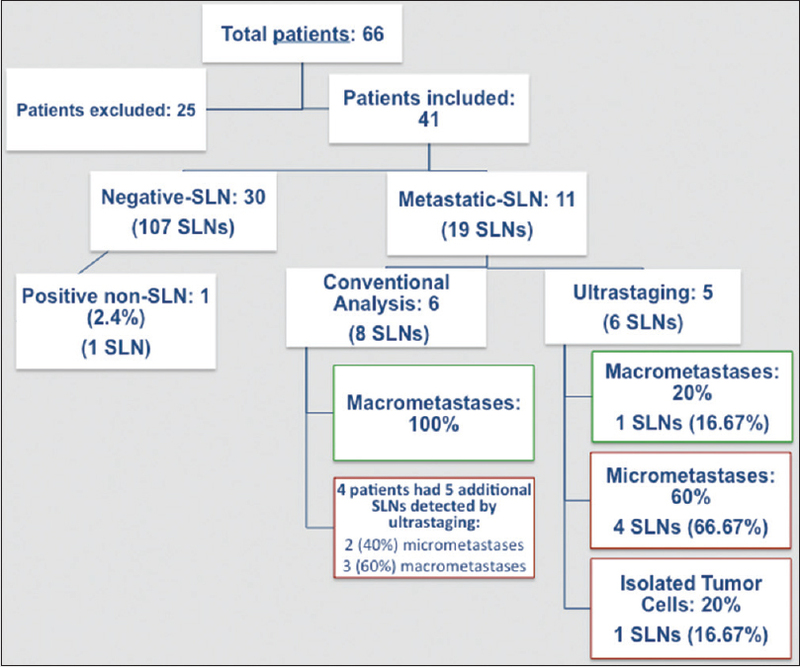 Twelve (26.8%) patients had metastatic nodes, 11 of them (91.7%) detected by SLN technique, of which 9 (81.8%) had only the sentinel node affected. False-negative rate was 2.4% after ultrastaging procedure. Metastatic SLN detection with ultrastaging was 45.5% higher than the intraoperative analysis, 63.6% of which had low tumor burden. The global detection of patients with nodal metastases after SLN technique was 21.9% higher than pelvic lymphadenectomy. Conclusions: Our preliminary results corroborate that SLN biopsy selectively maps metastatic nodes and ultrastaging increases the detection of metastatic SLNs, predominantly due to low tumor burden. Assuming that n patients in surgical or maternity wards are admitted T days (T = 0, 1, 2 … n) prior to the date of surgery or delivery for clinical check-up, an attempt has been made to develop the best appropriate probability model on Geiger–Muller counter type-II, to describe the arrival of patients and the busy (locked) period in the hospital. The problem is further extended to obtain optimal solution loading to (a) uniform type of medical care and (b) for providing medical care for a maximum period depending on the complications on an average, subject to the fixed budget of the hospital. Background: Drug promotional literature (DPLs) is an integral part of pharmaceutical marketing strategy. This marketing approach influences, a physician to prescribe definite variety of medicine from a particular company. Many physicians bank on exclusively in DPLs. This research was intended to appraise the DPLs available in Bangladesh for accuracy, consistency, and validity of the information in accordance with the WHO rules and regulations. 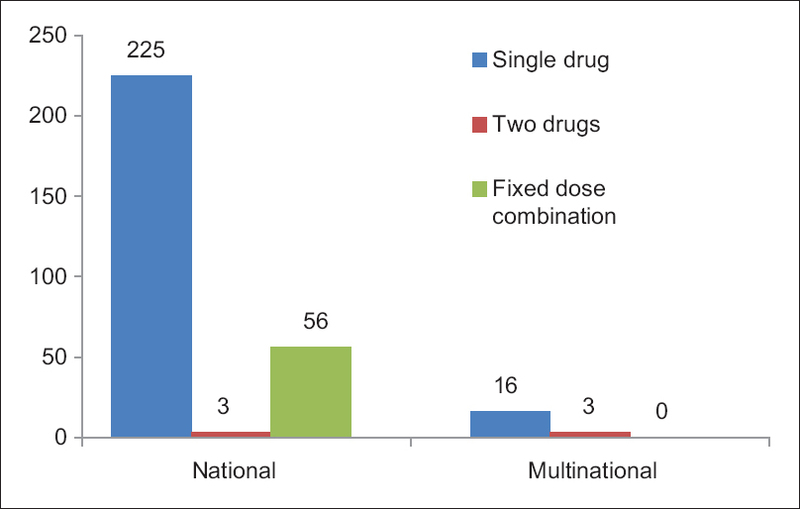 Materials and Methods: This was a cross-sectional study was conducted in Uttara Adhunik Medical College, Dhaka, Bangladesh after collecting DPLs from the different outpatient department. The data was analyzed Microsoft Excel 2016. Results: None of the national and multinational DPLs fulfilled all the WHO criteria. Among the national and multinational DPLs, 94.7% and 100% presented with claims respectively. Out of 284 national and multinational DPLs references citation were presented in 82.04% and 100% respectively. Among the DPLs of national and multinational companies' relevant, irrelevant, and partially relevant pictures were presented in 48.79%, 24.65%, 26.76% and 31.58%, 26.32%, and 42.11%, respectively. Conclusion: DPLs of Bangladesh did not comply with the WHO guidelines while promoting their products. Evidence provided in those DPLs were mostly biased and persuasive since it is focusing mainly on the positive aspect of drug therapy. Accordingly, studied DPLs were principally aiming to maximizes industries' financial benefit rather than fulfill the educational aspects. The Government of Bangladesh should develop very stringent policy and practices regarding DPLs based on science and the WHO guideline as the literature very often act as a primary source of information among medical doctors. Purpose: The aim is to study the diversity in the composition of kidney stones and its association with the basic biochemical metabolic panel in patients with kidney stone disease (KSD). 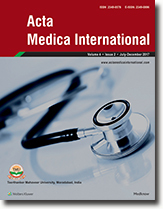 Methods: A cross-sectional prospective study enrolling consecutive patients with KSD attending a tertiary care hospital in Mangalore (India) was undertaken. 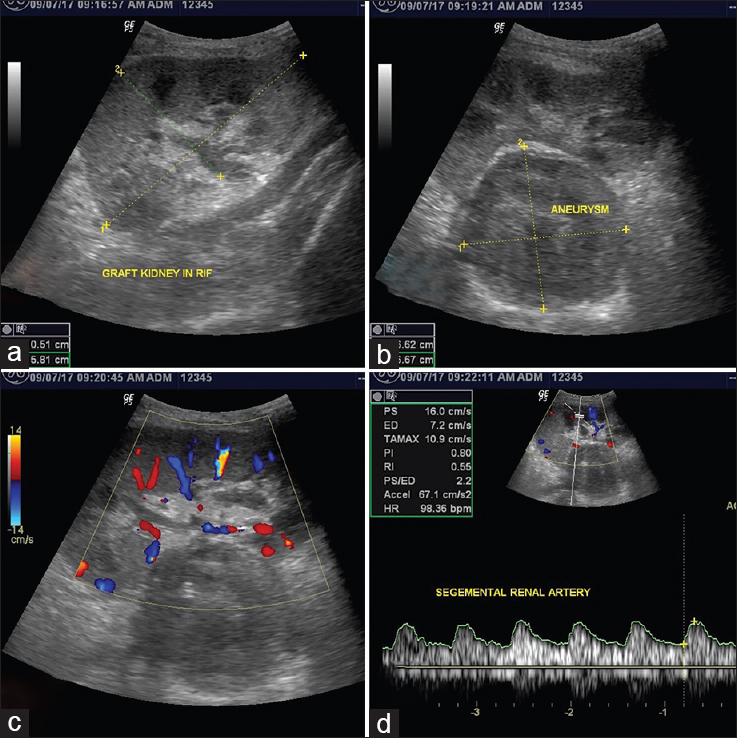 Mineral compositions of kidney stones were analyzed using attenuated total reflection-Fourier transform infrared spectroscopy. Kidney stones were classified into different groups according to the composition. Metabolic status was assessed to analyze possible association with the kidney stone. Results: A total of 369 patients (male 305 and female 64) in the age group of 43.05 ± 14.3 years were included in the study and showed a high diversity of kidney stone types with >50% with mixed compositions. A significant association was found between pure stone type and gender as well with age group (P < 0.001). Serum calcium levels in the calcium oxalate stone formers were significantly higher (P < 0.001) than others. Similarly, uric acid stone formers showed higher random blood sugar, blood urea, uric acid, and serum creatinine levels (P < 0.001). Urine pH was also found to be a contributing factor for the stone formation (P < 0.001). Stone recurrence did not differ significantly concerning stone composition as well as metabolic status. Conclusion: The study reports a high diversity of the kidney stone types among patients. This finding highlights the increased cases of mixed stones that may be because of various lifestyle factors resulting in altered metabolic status. This finding warrants mechanistic studies to understand the etiology of stone formation. This will enable to develop novel noninvasive interventional strategies and proper preventive strategies to reduce the risk of KSDs. Objective: The aim of this study is to assess the nutritional status of general population living in Faisalabad and to determine the association between dietary intake and iron deficiency anemia. Subjects and Methods: A cross-sectional survey was conducted in Faisalabad on 216 subjects (11–35 years of age) and subjects were selected using simple random sampling living in during the study. So far the methodology on the basis of the hypothesis of Z- test I have arrived at the conclusion at confidence interval 98% following results were found. 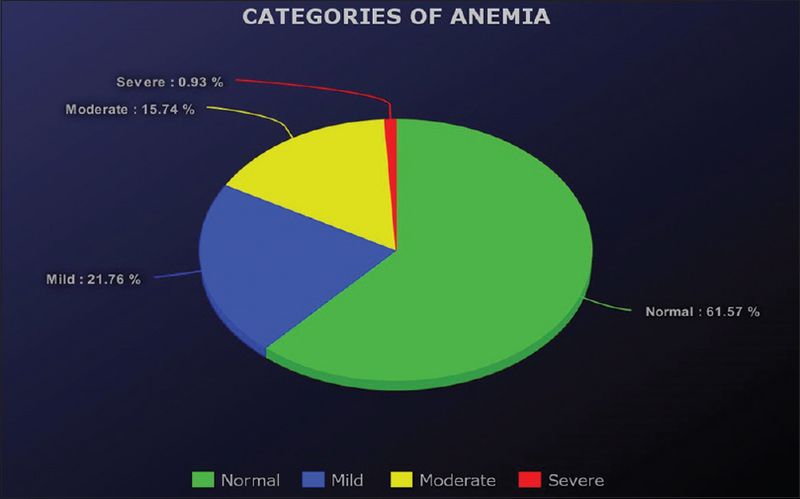 Results: Nearly 38.43% of the participants had anemia, among them 21.76% of the participants had mild anemia, 15.74% of the participants had moderate anemia and 0.93% of the participants had severe anemia. The 34.25% of participants were underweight and 9.7% of participants were overweight. More than 55% of females were suffering from anemia. Conclusion: Most of the female participants had anemia. There was a significant association between the intake of meat and hemoglobin level. Hence, special measures should be taken to provide dietary education, especially to females to have healthier mothers in the future. Introduction: Snakebite is an Egyptian health problem since ancient Egypt. Meanwhile, there is still no controlled geographical and medical studies on locally prevalent snake family intoxication. Aim and Methods: The present study aimed to investigate local snakebites presentations, management, prognosis, and the effect of the polyvalent antivenom, locally produced by the Holding Company for Biological Products and Vaccines (VACSERA) through the year 2015. Results: A total of 87 snakebites caused by venomous and nonvenomous species were recorded. 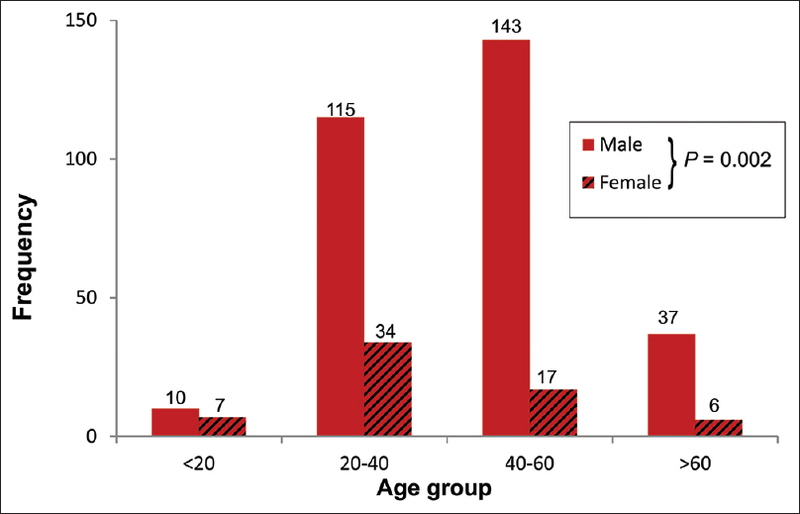 Most cases were middle-aged males. Most cases presented in summer and in the evening time. Two major groups of venomous Egyptian snakes were identified, Viperidae and Elapidae species, based on history, characteristic symptoms, and laboratory findings. Most snakebites (56 cases) were reported to be nonvenomous bites (64.4%). Twenty-one cases (24.1%) of snakebites were reported to be venomous bites by Elapidae snakes and 10 cases (11.5%) were reported to be venomous bites by Viperidae snakes. Antivenom was administered before referral to 37 (42.5%) of cases, and 19 only of them were victims of venomous snakes. Thirty-six (41.3%) patients received antivenom during admission including all cases of the venomous bites and 8.9% of nonvenomous bites' cases. Conclusion: Patients who had moderate or severe symptoms were effectively treated with VACSERA's polyvalent antivenom, with doses related to the severity grading and snake species identification. Additional antivenom doses were repeated on the bases of the clinical condition. Many snakebite victims referred from primary health centers received inadequate or nonnecessary doses of antivenom. No cases of anaphylaxis were recorded. There were no mortalities with current National Center for Clinical and Environmental Toxicology's protocol of treatment. Objective: The youths' sexual behaviors are counted as the main priorities of the public health due to the high prevalence of unwanted pregnancies, illegal abortions, and sexually transmitted infections. This research was carried out to explain the youths' contraceptive knowledge and practice in premarital sexual relationships. Methods: This qualitative research was carried out on 30 single boys and girls aged 18–24, living in Isfahan, Iran, who had already started sexual activities. Data collection was done with semi-structured interviews. The data were analyzed by using conventional content analysis. Results: Two main categories were extracted including inadequate awareness regarding contraception (with subcategories “unreliable information sources” and “gender inequality in familiarity with contraceptive methods”) and inappropriate contraceptive practice (with sub-categories “use of unreliable contraceptive methods” and “gender inequality in applying contraceptive methods”). Conclusion: Sexual health education programs should equip the youths with adequate knowledge on contraception and use of reliable contraceptive methods. Furthermore, attempts should be made along with tackling gender inequality is very significant for youths' sexual and reproductive health security. Diabetes mellitus and periodontitis have been said to have a bidirectional cyclical relationship, with diabetes leading to oral disease, and periodontitis, in turn, exacerbating hyperglycemia. Periodontitis is recognized as the sixth major complication of diabetes, having increased prevalence and severity in patients with diabetes. Early diagnosis of diabetes in patients with periodontitis can lead to the prevention of major morbidity and mortality associated with the disease. Therapy for diabetes may also lead to the improvement of periodontitis. In this review, we are presenting the current knowledge of the interplay and interaction between these two entities and the available data regarding treatment of the two entities together. A rare case of a large pseudoaneurysm at the anastomotic site of internal iliac artery with the graft renal artery in a case of renal transplant is presented with a vision of documenting this condition and making clinicians familiar with this rare postsurgical complication in patients of renal transplant.